"I'm sure we've all swatted thousands of mosquitoes in our lifetime but probably haven't thought too much about what their little brains are actually doing," says Michael Dickinson, who has developed a profound appreciation for these tiny insects after studying them for several years at the California Institute of Technology. A female mosquito's ability to reproduce and feed her young depends on her ability to track a host for protein-rich blood. Said another way: no blood, no mosquito babies. She thus evolved, over millions of years, to persist in finding a host despite many obstacles. One is that insects don't see the world as clearly as we can. They can only form grainy, pixelated images. "When a mosquito first sees a human, it would only see this little tiny dark blob at a distance," says Dickinson. So the mosquito developed a sharp sense of smell to get around this issue of poor visibility. At distances of greater than 10 meters, they can pick up on the scent of carbon dioxide, or CO2, gas, which all mammals exhale. But, as Dickinson says, "you can't land on a smell." He wondered how a mosquito is able to go from catching a whiff of its victim several meters away to eventually landing and biting down on a patch of skin. His previous work on fruit flies told him that a mosquito's vision might be playing a "large and underappreciated role" in this intricate quest for fresh blood. Tracking fast winged creatures like mosquitoes to know when and where they look at something is a major challenge in studying the role of vision. So Dickinson developed an elaborate wind tunnel that he could pipe CO2 into and tracked mosquitoes' flight patterns with several cameras as they zoomed around the tunnel. 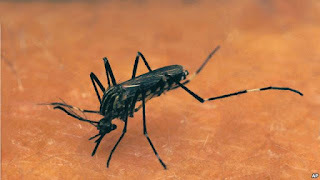 He says that the hungry female mosquitoes he unleashed in the tunnel ignore these images until they "get a hit" of CO2. CO2 tells them to start paying attention to the visual world around them, so they can find a host to land on only when the time to start looking seems right. "It's a bit like if you were in a room filled with people and you're looking for your husband or your wife. If you ran up to every person and looked in their face to see if it was your loved one, that would waste a lot of time,"
Dickinson explains. "But let's say you smelled the perfume or the aftershave of your spouse. That's the cue that you should start paying attention to the faces around you. That seems to be the strategy that the mosquitoes are using." And the mosquitoes, Dickinson says, use this strategy of sniffing and searching over and over again until they eventually find not just any object, but the source of the CO2 that emits warmth and special odors from its skin -- a real live human or animal host. Although he was not involved with the study, Matt DeGennaro at Florida International University says this understanding of the mosquito's search strategy could help design the next generation of repellents. "We have to look at these different steps and figure out different kinds of chemistries that could block the receptors and the genetic players for all of these steps -- to design new strategies to control behavior," DeGennaro says. This is no easy task, but he has joined in these efforts by creating genetic mutations in mosquitoes to alter their sense of smell. As millions of people face the threat of death from mosquito-borne diseases such as dengue, yellow fever and malaria each year, diverting a mosquito's attention away from its host would succeed where sprays, candles and nets fail as long-term defenses against the insect's bite.